← one hit wonders: introducing We Five! 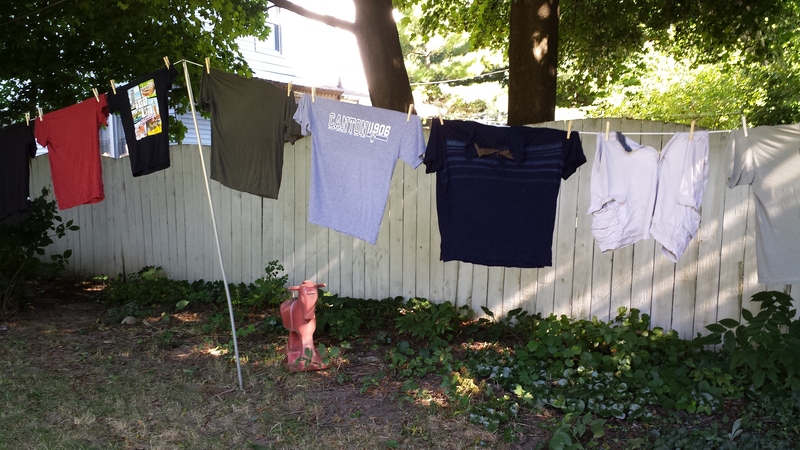 My laundry, July 2013. T-shirts are pretty much all I wear in the summer. A soft breeze stirred the morning air, carrying the aroma of baked goods and the faint whiff of a skunk. As I hung up each item of clothing, I noticed these smells and heard the birdsongs and other sounds of the day. There was nothing to distract me from them, nothing but the regular motion of fitting clothespin to fabric to clothesline. I had a lot to be calmed down about that morning. If a heavy punching bag had been at hand I would have taken a baseball bat to it. Such are the frustrations of living in the new economic order, where insecurity crouches on your shoulder and self-reinvention is a never-ending task. As part of my coping with this unsettling state of things, I decided to hang out the wash. This was suggested as an energy-saver by my electric utility. Of course, that only saves the energy you pay for; you must transfer the energy to yourself in order to hang up the laundry. The exchange is well worth it, I found. Clothesline procured, I strung it between my house and my garage, where years ago laundry did indeed hang. I finally took the old one down because the only thing hanging on it was grime. — First, how heavy a laundry basket of wet clothes is. Carting clothes up from the basement should be a track and field event. — How quickly the line fills up. It doesn’t take that many T-shirts, shorts, socks and briefs to cover 30 feet when you are stretching them all out. — How satisfying it is to hang up something wet and know that it is going to become dry through natural causes. Each item is one more plus for the earth and one less kilowatt burned. — How tedious it is. When you’re hanging laundry, you’re not doing anything else. Stoop over, pick up wet clothing, open the wooden clothespin, fix it to the line. Over and over. This is what you’re doing for the next 10 minutes. But it’s in the tediousness that the blessing comes. Because when you can only do one thing, you just do that one thing. There’s no checking your phone, no keeping an eye on the ballgame. You focus just on the wet clothes, the clothespins, the clothesline, the soft breeze, smells and sounds. Life becomes extremely simple for those 10 minutes, and your mind calms down accordingly. Now I know why those housewives looked so happy in the old Tide ads. For just 10 minutes, they didn’t have to deal with the kids, the crabby husband or anything else. It was just them, the clothes and the warm midday sun. When you eat, eat, goes the Zen saying. When you sleep, sleep. Hang clothes, hang clothes. Let your mind rest in that simplest of activities. Let your thoughts hang on that line, just momentarily, fluttering like a Beatles T-shirt in the delicious breeze. Great essay. It’s a mindset that’s become foreign to our present world of extreme multi-tasking. Thanks for capturing it in words on paper.